Trogir history begins around the 3rd century BC when Doric Greeks from Issa, a Syracusan colony on Vis Island, founded a trading port here called Tragurion. The name derives from "Tragos" which is Greek for goat! In true Greek style the town was enclosed by megalithic walls and the streets were laid out in a grid pattern that is still evident. Later, a warring tribe of Dalmatians launched repeated attacks on Tragurion forcing Tragurion and Issa to turn to Rome for assistance in 156BC. The Issa community disintegrated in 46BC and Tragurion became a Roman Municipality. The town was becoming prosperous from exploiting nearby limestone quarries and became renowned for the quality of its stone. Trogir's great rival at the time was Salona. As ancient Salona increased in prestige and prosperity, Trogir became less important to the Romans. When the Roman city of Salona was destroyed by Slavs and Avars in the 6th and 7th centuries, many of its inhabitants fled to Trogir which managed to keep its independence. The newly arrived Slavs set up farms outside the town and then gradually moved within the city walls. In the 9th century, Trogir, became part of a Byzantine province whose capital was Zadar and at the end of the 10th century, Venice made its first, though not its last incursion. 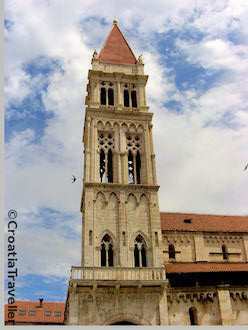 After first paying tribute to Croatian rulers, Trogir became the seat of the bishop in the 11th century. In 1107, the first Croato-Hungarian king, Kolomon, confirmed Trogir's municipal rights and Trogir swore allegiance to Hungary. Alas, the era of peace came to an abrupt end when the Saracens destroyed the town in 1123. Rebuilding commenced and by the 13th century Trogir's booming economy sparked an architectural renaissance. When Venice essentially bought Dalmatia in 1409, Trogir refused to accept its new ruler which provoked Venice into laying siege to the town. Finally in 1420 the triumphant Venetians entered the town and ruled until 1797. 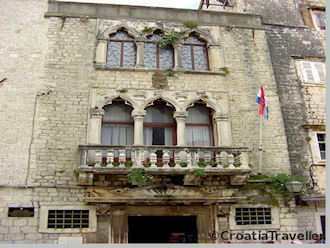 Most of the architecture that so impresses visitors to Trogir dates from the 13th to 16th centuries when the town's cultural life flourished despite Venice's incessant wars with the Turks. When Venice fell in 1797, Trogir was taken over by the Austrians who were succeeded by the French who then, again, yielded to the Austrians until 1918.